Cannily positioned in the U.S. as the distaff answer to Richard Linklater’s Boyhood, Céline Sciamma’s third feature (following Water Lilies and Tomboy) Girlhood doesn’t follow its protagonist over the course of 12 years, or even over more than a year or so. All the same, Marieme (Karidja Touré) goes through nearly as many shifts in appearance and identity as Boyhood’s Mason. Her life, as seen in this brief window of adolescence, is a process of perpetual reinvention, largely because each of her attempts to fit in with a group leaves her dissatisfied. One of the few complaints people have raised about Boyhood is that it (perhaps unwittingly) privileges the experiences of white males; nobody will be lobbing that grenade at Girlhood, which speaks powerfully about marginalization and the difficulty of overcoming it. That makes the film sound like cold oatmeal, though, when it really provides the sugar rush of pre-sweetened cereal. Its original French title, Bande De Filles, more accurately translates as Girl Gang, and the film kicks into gear when Marieme, introduced as a sweet, unassuming teen, encounters a group of three badass girls: Lady (Assa Sylla), Adiatou (Lindsay Karamoh), and Fily (Mariétou Touré). Initially, Marieme starts hanging out with them primarily because they’re friendly with a boy she has a crush on, but before long, she’s ditched her cornrows, straightened her hair to match theirs, and started intimidating white kids at school into giving up their lunch money. When Lady gets the crap beaten out of her in a brawl with a girl from a rival gang, it’s Marieme—calling herself Vic, short for “Victory”—who avenges her in a rematch. Eventually, however, the gang starts to seem like a dead end, at which point Marieme/Vic dons a short blond wig and starts slinging drugs for a local dealer. Later still, she binds her breasts tightly and adopts an androgynous look, and her actions make it unclear whether she’s sexually attracted to men or to women. Both Water Lilies and Tomboy explored similar material—fluctuating sexual/gender identity and adolescent heartbreak—but Sciamma’s touch is lighter and more nuanced in Girlhood, which refuses to pin any of its characters down, even in their vacillations. The film playfully (given its title) opens with a tackle-football sequence featuring young girls slugging it out in helmets and shoulder pads, and Marieme’s time in the gang, as Vic, mirrors the conventional narrative arc of numerous similar movies about male gangs. At the same time, though, these are unmistakably women, no matter how vicious they sometimes get, and Girlhood isn’t afraid to stop cold and let the foursome joyously lip-sync to the entirety of Rihanna’s “Diamonds,” or engage in tender group hugs when one of them is feeling down. Men are represented as both domineering (Marieme’s older brother, who’s prone to slapping her around when she displeases him) and compassionate (her sort-of boyfriend, who refreshingly is objectified much more than any of the women). Even the fights are remarkably complex: When Marieme suddenly pulls a knife during one, it’s not to stab her opponent, but to cut off the girl’s bra, which she later triumphantly displays as a trophy of war. 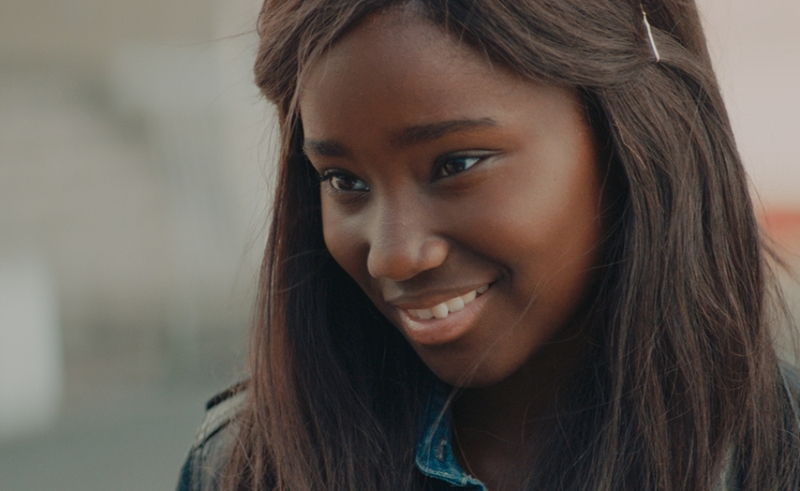 Toward the end of Girlhood, things get a little murky, and not necessarily in a productive way. When Marieme binds her breasts, is she trying to become a man, because her new world (the drug trade) is so thoroughly male-dominated? Or does this reflect a genuine identity crisis, similar to the one at the center of Tomboy, which is about a girl whose tomboyishness extends into a transgender identity? While it’s admirable that Sciamma wants to avoid putting anyone in a box or slapping a label on them, late-breaking hints that Marieme may have been in love with Lady all along, or vice versa, or both, threaten to cross the line from ambiguous into coy. Touré’s magnificently expressive performance falters a bit here, as if the actor, who’s spent the entire film up to this point silently conveying Marieme’s every roiling emotion, has lost her bearings—at the crucial moment, she goes a bit blank. Or maybe it’s just that Sciamma’s direction of these scenes fails to convey what she’s after. Still, better that than a movie that insists on spelling everything out in capital letters. Girlhood’s final shot employs a sudden rack focus that shifts the mood from despondent to determined, and that tension, by and large, is masterfully explored.